Petroliam Nasional Bhd (Petronas), through subsidiary Petronas LNG Ltd (PLL) and shipping affiliate MISC Bhd, plans to team up with Gas4Sea partners and identify business opportunities in the supply of liquefied natural gas (LNG) as marine fuel. In a statement, Petronas said PLL and MISC had inked a non-binding memorandum of understanding (MoU) on Tuesday last week with the LNG bunkering group, comprising Engie SA, Mitsubishi Corp and Nippon Yusen Kabushiki Kaisha (NYK), to explore potential collaboration in promoting LNG as the preferred marine fuel. Gas4Sea was formed last year to jointly promote LNG as the cleaner maritime fuel by providing ship-to-ship LNG bunkering operation in the global market. Signing on behalf of PLL and MISC were PLL chief marketing officer & chief executive officer Ezhar Yazid Jaafar and MISC vice president of LNG business unit Faizul Ismail. 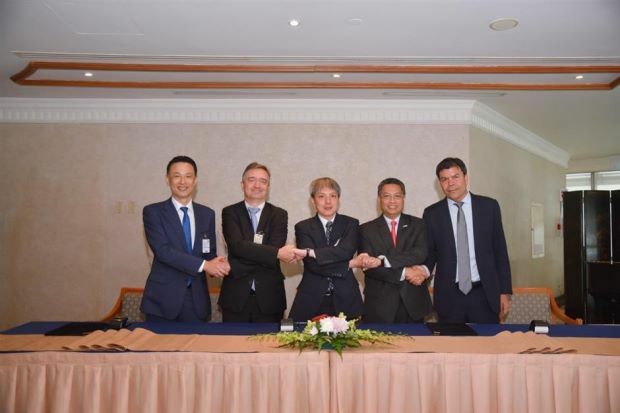 Gas4Sea partners were represented by Mitsubishi general manager of LNG bunkering business office Yuji Toshima, Engie senior vice president of business development (Asia) Denis Bonhomme, and NYK manager of fuel project team Takahiro Nito. “Petronas is looking at ways to further promote the consumption of LNG beyond the existing markets portfolios, and advocating LNG as marine fuel is a new frontier for the LNG sector.” he said. Gas4Sea partners are major players in the energy and global shipping industries. With their world’s first purpose-built LNG bunkering vessel based in the port of Zeebrugge (Belgium), they are equipped with a key piece of the LNG bunkering value chain to extend the reach of LNG to fuel the marine transportation sector. “In addition, this collaboration will also support the usage of LNG as a fuel of choice for maritime activities, which is in line with Petronas’ effort in helping the industry reduce its carbon footprint,” said Ezhar. The Petronas group has diversified its LNG supply portfolio in recent years with the addition of Australia Gladstone LNG and Petronas’ first floating LNG facility in offshore Sarawak.